Meet the leaders of One Call for All who send the annual red envelope that gives you one easy way to donate to all of your favorite local nonprofits. On this podcast, the board president of One Call, Bruce Weiland, and Executive Director Holly Rohrbacher, tell the story of the “Red Envelope campaign” that is now in its 54th year. Holly Rohrbacher, Executive Director, and Bruce Weiland, President of the Board, of One Call for All. The papers in your red envelope give you an easy way to mark your choices for your annual gifts to your favorite local charities. Every penny you designate to the organizations of your choice will go to those designated organizations. One Call for All does not take any share of the dollars you designate. With just one part-time staff member and an all-volunteer working board, One Call for All is a lean running organization. And the annual stuffing and stamping of about 10,000 red envelopes is performed generously by about 100 community volunteers. For this current campaign ending December 31st, the benefits will flow to 96 nonprofits that serve Bainbridge Island needs. 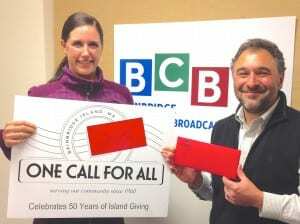 Last year, for example, your Red Envelope gifts to Sustainable Bainbridge provided funds for all the radio equipment for our BCB studio and the rent for BCB’s 2014 start-up year at the Marge Williams Center. This campaign saves you and local nonprofits from getting involved in duplicative and repeated solicitations. It’s so simple to engage in just one consolidated call per year for all the essential nonprofits of the community. Further information is available at the One Call for All website, here. Credits: BCB host: Barry Peters; BCB audio editor and music intro: Tim Bird; BCB ferry music: Dogfish Bay Studios; BCB podcast art: artopia creative.